Could taking an aspirin a day slow brain power decline? Dr Simon Ridley, head of research at Alzheimer’s Research UK, said: “The results provide interesting insight into the importance of cardiovascular health on cognition, but we would urge people not to self-medicate with aspirin to try to stave off dementia. A mass-screening programme for 50- to 70-year-olds could cut the risk of stomach bleeds experts have said. 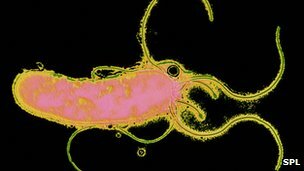 About a third of this group carry the bacterium Helicobacter pylori, which makes stomach bleeds three times more likely – and antibiotics eradicate it. Professor Jack Cuzick told BBC’s Newsnight screening would make the choice to take aspirin to help protect against cancer a “no-brainer”. He said the test is easy to do and eradication only takes five days. Research has shown taking low-doses of aspirin can cut the risk of cancer. “Bleeding is the only major setback. “It’s trying to identify those who are infected that matters,” said Prof Cuzick, an epidemiologist at the University of London and president of the International Society on Cancer Prevention. The society working with an international team of experts on cancer prevention is expected to publish a statement on the risks and benefits of long-term aspirin use within weeks. “We will say this looks very important and needs to be further evaluated”, Prof Cuzick said. The society first looked into aspirin as a cancer-prevention measure in 2009, and has reconvened as evidence of potential benefits has grown. Taking low-dose aspirin for five years halves the risk of developing colon cancer, according to data published two years ago by Peter Rothwell, from Oxford University. But Prof Cuzick told Newsnight the most up-to-date data showed “much stronger results”. Last year, research indicated daily low-dose aspirin cut the risk of dying by 66% for oesophageal cancer and 25% for lung cancer. When researchers looked at all solid cancers together, the risk also fell, by 25%. This year, the team looked at aspirin’s effect on the spread of cancer, and found it reduced the risk of secondary spread to the lungs, liver and the brain by “about half”. Low-dose aspirin is already recommended to cut the risk of heart attack and stroke, but there are no national guidelines on who should consider taking it to prevent cancer, or how much to take. An aspirin a day may protect against skin cancer, some experts believe. 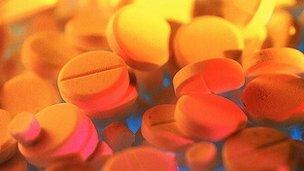 People who take aspirin tablets or similar painkillers on a regular basis cut their risk of developing skin cancer – including the most deadly type – malignant melanoma – by about 15%, research suggests. The work in the journal Cancer involved nearly 200,000 people in Denmark. But experts say using sunscreen and avoiding too much sun are still the best ways to prevent skin cancer. In the study, approximately 18,000 of the 200,000 participants had been diagnosed with of one of three types of skin cancer – basal cell carcinoma, squamous cell carcinoma, or the rarer but more dangerous malignant melanoma. The researchers looked at the medical records of the individuals to calculate how many had been prescribed non-steroidal anti-inflammatory drugs (NSAIDs) such as aspirin, ibuprofen and naproxen over an eight-year period. Many were taking them for heart conditions or arthritis. Those who were more frequently prescribed NSAIDs were less likely to have skin cancer. The higher the dose and the longer a person had been on the medication, the greater the protective effect. Individuals with more than two prescriptions for NSAIDs had a 15% decreased risk for developing squamous cell carcinoma and a 13% lower risk of malignant melanoma. NSAIDs did not appear to lower the overall risk of basal cell carcinoma – the most common and least aggressive type of skin cancer. But they did cut the risk of basal cell carcinomas developing on certain parts of the body other than the head and neck. The researchers from the University Hospital in Denmark say more research is needed to confirm and further explain their findings. Studies in animals suggest NSAIDs may block the growth of early pre-cancerous skin lesions, but it is not yet clear if this is also the case in humans. Scientists already suspect that these drugs may protect against many other cancers, including bowel cancer. The researchers point out that although they found a link with prescriptions they were not able to monitor precisely how much of the drug a person actually took. Also, people can buy drugs like aspirin from a pharmacy without a prescription. And they did not look at sun exposure – the root cause of skin cancer. Experts say even if NSAIDs do offer some protection against skin cancer, people still need to be sensible in the sun. Hazel Nunn of Cancer Research UK said: “By far and away the best way to reduce the risk of skin cancer is to enjoy the sun safely, and take care to avoid sunburn. “Sunburn’s a clear sign that your skin’s been damaged, and this damage can build up over time and lead to skin cancer in the future. When the sun’s strong, use a combination of shade, clothes and at least SPF 15 sunscreen to protect your skin. Aspirin could be as effective as more expensive drugs for heart failure patients with a normal heart rhythm, according to researchers. Their study on more than 2,000 patients, published in the New England Journal of Medicine, said aspirin was as effective as the commonly prescribed drug warfarin. It said each drug had risks, but they had similar benefits overall. However, a UK cardiologist argued the risks from warfarin were less serious. Heart failure is a major health problem in many parts of the world. It affects 900,000 people in the UK and six million people in the US. A failing heart struggles to pump blood around the body, meaning even trivial tasks become exhausting. As the blood is not pumped round the body as efficiently the risk of a blood clot increases, if a clot blocks blood to parts of the brain it will result in a stroke. Patients are treated with drugs to reduce the risk of a fatal blood clot forming. However, researchers said it was unknown whether aspirin or warfarin was the better treatment in the 75% of heart failure patients who still have a normal heart beat. Researchers gave 2,305 patients, in 11 countries, either aspirin or warfarin. The combined risk of death, stroke and major bleeding was the same for each drug, according to the researchers. Patients taking warfarin had a much lower risk of stroke, but had a high risk of bleeds. They said that after four years there was a “small benefit” with warfarin, but it was “borderline” and of “uncertain clinical significance”. They concluded: “There is no compelling reason to use warfarin rather than aspirin”. The lead researcher, Dr Shunichi Homma, from the Columbia University Medical Center, said: “Since the overall risks and benefits are similar for aspirin and warfarin, the patient and his or her doctor are free to choose the treatment that best meets their particular medical needs. However, Dr Andrew Clark, from the British Society for Heart Failure and the University of Hull, told the BBC: “The study shown here demonstrates that warfarin quite markedly reduces the risk of stroke associated with heart failure compared with aspirin, but at a cost of an increase in major haemorrhage. “How to interpret that for individual patients means weighing the risk of stroke against the risk of haemorrhage, but also weighting that by importance. “I would regard a gastrointestinal haemorrhage requiring transfusion as being of less importance than a stroke, so would tend in favour of warfarin. Dr Walter Koroshetz, who is the deputy director of the US National Institute for Neurological Disorders and Stroke, said the study would have “a large public health impact”. He added: “Patients and their physicians now have critical information to help select the optimum treatment. 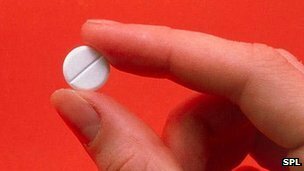 Bowel cancer patients who take daily aspirin could cut their chance of dying from the disease by about a third, experts believe. A study in the British Journal of Cancer looked at 4,500 bowel cancer patients living in The Netherlands. All of the patients on aspirin were taking a low dose – 80mg or less a day – something already recommended for people with heart disease. But experts say it is too soon to start routinely offering it for bowel cancer. A wealth of evidence already suggests aspirin might prevent certain cancers from developing in the first place. And more recent work suggests it might also work as a cancer therapy – slowing down or preventing a cancer’s spread. But the drug can also have unpleasant and dangerous side effects, causing irritation of the stomach lining and internal bleeds in a very small minority of patients. In the study, which spanned nearly a decade, a quarter of the patients did not use aspirin, a quarter only took aspirin after being diagnosed with bowel cancer, and the remaining half took aspirin both before and after their diagnosis. Most of the patients on aspirin had been taking it to prevent cardiovascular disease-related problems like stroke or heart attack. 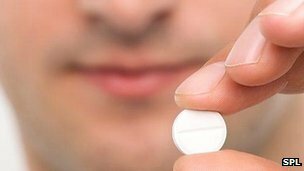 Taking aspirin for any length of time after diagnosis cut the chance of dying from bowel cancer by 23%. The patients who took a daily dose of aspirin for at least nine months after their diagnosis cut their chance of dying from the disease by 30%. Taking aspirin only after bowel cancer had been detected had a bigger impact on reducing mortality compared with when aspirin was taken before and after diagnosis – reducing death risk by 12%. This may be because those who took aspirin and still got bowel cancer had a particularly aggressive form of tumour that did not respond as well to aspirin, say the researchers. He said aspirin should not be seen as an alternative to other treatments, such as chemotherapy, but could be a useful additional treatment. He said they now planned to hold a randomised controlled trial – the “gold standard” in medical research – to look at how well aspirin fared against a dummy drug in people aged over 70 with bowel cancer. 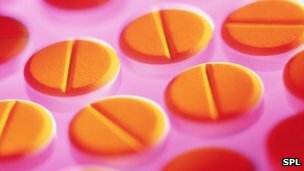 Sarah Lyness of Cancer Research UK said: “This latest study adds to the growing evidence about the benefits of aspirin. “But we are not yet at the point where we would recommend people start taking aspirin to reduce their chances of developing cancer. “There are still questions we need to answer about the side effects, such as internal bleeding, who might benefit most from taking aspirin, who might be harmed, what dose and how long people some people might want to take it for. “Anyone thinking of taking aspirin to cut their risk of cancer should talk to their GP first. People with cancer should be aware that aspirin can increase the chances of complications before surgery or other cancer treatments such as chemotherapy, and should discuss this with their specialist.